The death of five young men who were employed to clean a septic tank in an upmarket residential community in New Delhi and five workers died in a septic tank in Odisha is a shocking reminder that India’s high-profile sanitation campaign has done little to alter some basic ground realities. Two days after the Prime Minister launched Swacchata Hi Seva, a national cleanliness drive, safai karamcharis (sanitation workers) from across Delhi will start their own campaign against manual scavenging to increase awareness and protest the deaths of five men in a city sewer last week. More and more incidents are being reported of workers dying in septic tanks. Sanitation has expanded along with urbanisation, but it has brought with it a higher number of deaths as workers clean septic tanks manually. Socio-Economic and Caste Census (SECC) released in 2015, states that there were around 18 million manual scavenging households in rural areas. 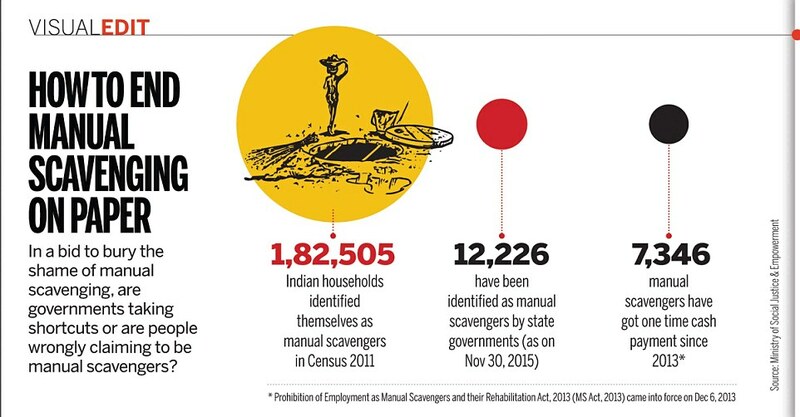 A government survey identifies 12,226 manual scavengers in 12 states. Most septic tanks are emptied manually in Indian cities. The lack of proper safeguards puts manual scavengers at risk of infections, which are occasionally fatal. Statistics show that 80% of India’s sewage cleaners die before they turn 60, after contracting various infectious diseases. The biggest challenge before the government is to check on private firms, which illegally engage people to clean sewers manually. Recently, Delhi Jal Board has prepared a Standard Operating Procedure for cleaning of sewers. The National Policy on Faecal Sludge and Septage Management, 2017, states that employment of manual scavengers is illegal, but it does not suggest mechanical alternatives to unclog septic tanks, drains and sewers. The workers are apparently asked to perform the cleaning task in violation of Section 7 of the Prohibition of Employment as Manual Scavengers and their Rehabilitation Act, 2013. Prohibition of Employment as Manual Scavengers and their Rehabilitation Act, 2013’ came into effect from 6thDecember, 2013. This Act intends to achieve its objectives of eliminating insanitary latrines, prohibition of employment as manual scavengers etc. India’s sanitation problem is complex, and the absence of adequate toilets is only one lacuna. The Swachh Bharat Abhiyan should make expansion of the sewer network a top priority and come up with a scheme for scientific maintenance that will end manual cleaning of septic tanks. The practice of manual scavenging, officially banned since decades in India, continues with impunity in several States. The latest Socio-Economic Caste Census data reveals that 1, 80, 657 households are engaged in this degrading work for a livelihood. Maharashtra, with 63,713, tops the list with the largest number of manual scavenger households, followed by Madhya Pradesh, Uttar Pradesh, Tripura and Karnataka, as per Census data. “Open defecation free” not only means that there is no visible faeces in the environment, it also means that every household and public institution uses safe technology to dispose of the same. The Social Justice Ministry, which is in charge of this subject, mostly deals with the issue of compensation post deaths and rehabilitation of the handful identified as doing this job. Ministries such as Housing and Urban Affairs should be looking into the complete mechanisation of sewage cleaning, which is the only way to eliminate the practice of getting people to clean it manually. Bio-toilets: Bio-digester toilets are designed to convert human waste into gases and manure. The zero-waste biodigester technology uses psychrotrophic bacteria to break down human excreta into usable water and gas. Once applied, the bacteria can work for a lifetime. Waste from toilets are sent to a giant underground bio-digester tank where anaerobic digestion takes place. The best feature of this toilet is that it totally does away with manual scavenging, is low on maintenance and installation cost and can be adapted to any geo-climatic conditions of the country.